The Megalithic Passage Tomb at Newgrange was built about 3200 BC. The kidney shaped mound covers an area of over one acre and is surrounded by 97 kerbstones, some of which are richly decorated with megalithic art. The 19 metre long inner passage leads to a cruciform chamber with a corbelled roof. It is estimated that the construction of the Passage Tomb at Newgrange would have taken a work force of 300 at least 20 years. The passage and chamber of Newgrange are illuminated by the winter solstice sunrise. A shaft of sunlight shines through the roof box over the entrance and penetrates the passage to light up the chamber. The dramatic event lasts for 17 minutes at dawn on the Winter Solstice and for a few mornings either side of the Winter Solstice. Admission to the Newgrange chamber for the Winter Solstice sunrise is by lottery, application forms are available at the Brú na Bóinne Visitor Centre. About 30,000 applications are submitted annually. In September each year, 50 names are drawn with 2 places are awarded to each person drawn. Newgrange has been designated a World Heritage Site by UNESCO and attracts 200,000 visitors per year. There is no direct access to the Passage Tomb at Newgrange, access is by guided tour from the Brú na Bóinne Visitor Centre located close to the village of Donore, Co. Meath. The last tour of Newgrange is 90 minutes before closing time of the Visitor Centre. Groups of 15 or more must book in advance. Images of Newgrange with the option to display larger views. Twelve Standing Stones survive of what may have been an arc at the front of the mound or possibly a complete circle of about 35 stones surrounding the mound. 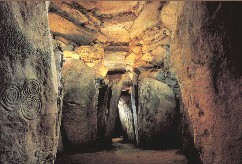 The Gavrinis passage tomb in Brittany is remarkable similar to Newgrange. The cairn is about 5500 years old, it is 60 metres in diameter and covers a passage and chamber which is lined with elaborately engraved stones. In the passage and chamber 23 of the 29 upright stones are engraved with zig-zags, concentric circles, herring bones, axes, bows and arrows. A Passage to the Afterworld - the story of New Grange adapted from an article first published in the The World Of Hibernia magazine. Directions to the Brú na Bóinne Visitor Centre the access point to Newgrange. Michael J. O'Kelly who excavated and restored Newgrange. Photographs of New Grange by Annaliese Moyer - Insight Photographic. Old Photograph of Newgrange and a newspaper report from 1928. Newgrange Books - factual books and a novel The Spirit Mound. Emerald Sun - prologue to the historical novel The Princes of Ireland by Edward Rutherfurd. The prologue sets the scene of ancient Ireland with the winter solstice at Newgrange the centrepiece. 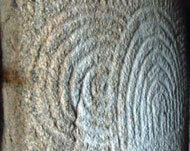 Newgrange: empowering the salmon of wisdom by Philip Coppens. An anthropological lens applied to the early settlers of the Boyne Valley, adapted from a lecture by Dr. Gabriel J. Byrne. Newgrange plans from Michael J. O'Kelly's book Newgrange Archaeology, Art and Legend. 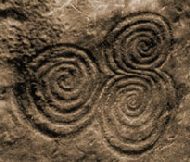 Newgrange Links - External resource links.